A new University of Toronto study confirms that recent climate warming in the central Yukon region has surpassed the warmest temperatures experienced in the previous 13,600 years, a finding that could have important implications in the context of current global warming trends. In a study published in the April issue of Nature Communications, paleoclimatologist and lead author Trevor Porter studies climate indicators such as water isotopes, tree rings and plant waxes for signs of climate patterns in the Holocene, a period of time that spans the past 11,700 years. In glaciated regions, paleoclimate research often relies on water isotopes measured from ice core samples taken from glaciers, but in central Yukon, where glaciers have long since receded, researchers must rely on other indicators such as plant pollen and small winged insects known as midges preserved in layers of lake sediment. Pollen and midges act as proxies for ancient temperatures but sometimes offer conflicting information. In a first for the field, Porter, an assistant professor in the department of geography at U of T Mississauga, and his colleagues used radiocarbon dating and water isotopes preserved in permafrost beneath a central Yukon peatland to reconstruct summer temperatures over the last 13,600 years. 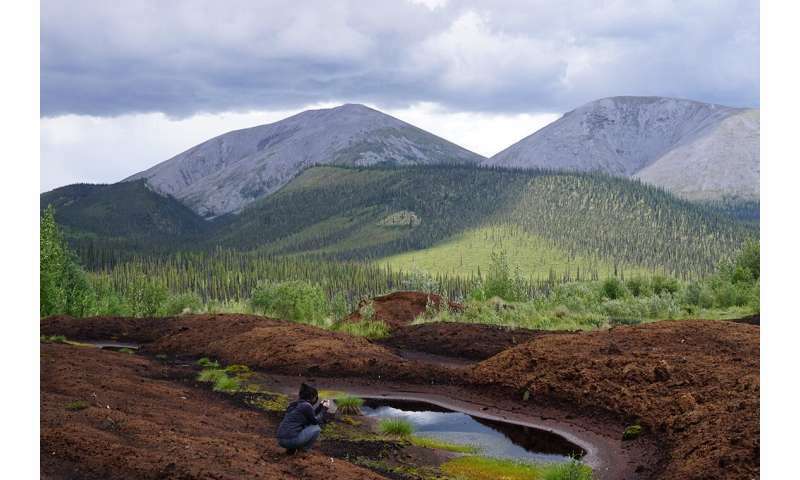 Each summer, new peat moss accumulates at the surface, and the top of permafrost, which lies at a constant depth of 58 centimetres below ground, adjusts to the new surface. It simultaneously preserves precipitation that filtered through the ground and froze at the top of permafrost during previous summers. "Each centimetre of permafrost holds roughly 20 to 30 years of precipitation, which settles into well-blended layers of information," Porter says. "Water isotope records from ice cores are one of the most valued climate proxies but can only be developed in glaciated regions. This project demonstrates that we can develop ice core-like records in non-glaciated permafrost regions. "This type of permafrost offers a unique archive for water isotopes that could be used to advance our understanding of Holocene climate change in other northern regions, which would be a major benefit to the climate science community." 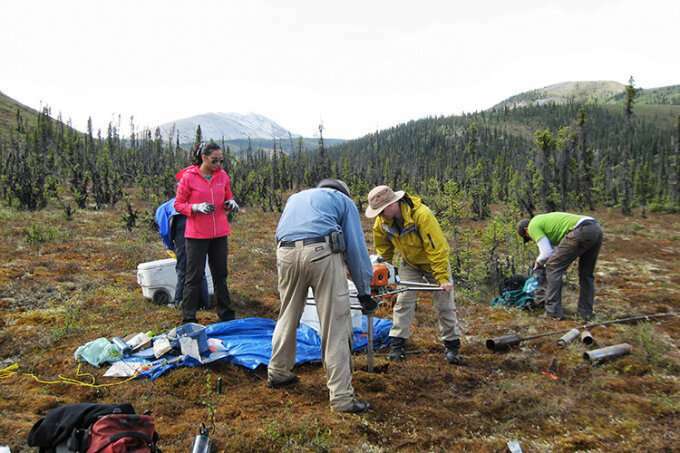 The results of the permafrost analysis confirms information provided by previous midge studies, and shows that early Holocene summers in the central Yukon were mostly warmer than the typical Holocene summer. The study further concludes that industrial-era warming has led to current summer temperatures that are unprecedented in the Holocene context, and exceeds all previous maximum temperatures by nearly 2 degrees Celsius. "When compared with climate reconstructions from other northern areas, our data confirm that this region has been warming at an exceptional rate," Porter says. "We know, based on recent historical climate data, that this area has warmed up more than other high-latitude regions. This region has experienced warming of just over 2 degrees Celsius over the past century, which is above the global average and above the average of the Arctic region in general." Summer warming has major implications for permafrost landscapes, Porter says. "When temperatures go up, ice-rich permafrost can thaw, become unstable, and previously frozen soil carbon can be released to the atmosphere as carbon dioxide by microbes," he says, noting that the region experienced a deep thaw of permafrost roughly 9,000 years ago. "Deep permafrost thaw events did occur in this region in the early Holocene, a time we now know was relatively warm compared to the Holocene average but not nearly as warm as today. This implies that ice-rich permafrost in this region is currently vulnerable to similar thaw events." Porter says there is evidence that climate warming is destabilizing permafrost in northern Canada and releasing greenhouse gases. "This is potentially the new normal and, if it accelerates in the near future, it threatens to further amplify global climate change." I don't really understand why so many people are so up in arms about global warming. It is so miniscule compared to microbes. Create starvation, with war, get pestilence of major proportions and one gets a calamity 100 times greater than global warming. That's because you are a selfish ignorant and dumb sockpuppet of antigoracle, baboons swinging trees, it is NOT minuscule you idiot, over time, it can completely eliminate life on earth. But YOU only see the banana that is in front of you today, not thinking about the future nor have the ability to do so ! Idiot !